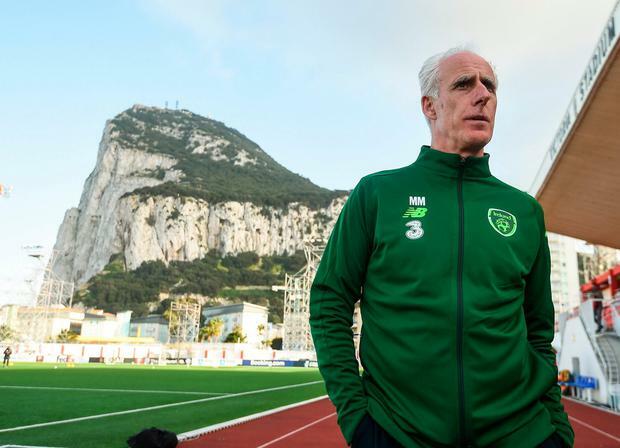 The time for talking is over as Mick McCarthy prepares to start his second stint as Ireland manager in Gibraltar this evening. Weather warnings due to forecast high winds have added another element to preparations for the game with the 194th-ranked side in the world. And McCarthy has pointed to Scotland's heavy defeat in Kazakhstan as evidence of what can happen if players take their eye off the ball. However, he is relieved to be back at work on the pitch after four months of build-up. "I think people are looking forward to getting back watching games," said McCarthy yesterday, ahead of an eight-match campaign that will shape Ireland's Euro 2020 destiny. "We have to be really on top of our game and make sure that we do everything properly. "The Scotland result (3-0 defeat) is a stark warning to us about what can happen." McCarthy admitted that he was feeling a bit of nervous energy ahead of his return to the Irish dugout following a 17-year absence. "I have got that feeling and I'm glad I have it because if I lose that, there's something wrong," he said. "It's been with me since the first game I've ever played. I can't explain it any other way." McCarthy is doing things different to his predecessor Martin O'Neill by letting his players know the side on the eve of the game. He confirmed that Seamus Coleman will start as captain, and hinted that Euro 2016 star Robbie Brady is vulnerable due to his lack of game time at Burnley. Coleman will win his 50th cap and believes it is important to leave the past behind after a disappointing 2018 that spelled the end for O'Neill. "This is a fresh campaign," he said. "We're all looking forward to what's ahead of us and what the new manager wants to do. The lads realise it wasn't good enough last year. "We want to be qualifying and winning games but we don't want to tie the new lads down with that baggage. "Just let them be excited to play for their country as it's a fresh start for all of us and I'd like to think those players will realise that." "Whether it's 10pc possession or 70pc possession, we just want to win." Ireland will not only have to cope with a Gibraltar side which has improved rapidly under new head coach Julio Ribas, and the plastic pitch on which UEFA finally ruled they can play their home games, but also the strong winds lashing the Rock. He said with a smile: "You are aware where we play our football? We don't play in ideal conditions all the time. "That's nothing that concerns me. I can't do anything about that. It is what it is. We'll just get on with it."